Hamilton was presented with a unique challenge when selected by the BNSF to repair and reinforce the U1 connections of its Columbia River Swing Span Bridge. Over the life of the bridge the continual cycles of opening and closing the swing span had resulted in wear of the U1 pin connection, which in turn caused the ends of the span to sag and prevented the lock from operating correctly. The greatest challenge to the project was access. Hamilton initially planned to conduct the repair with limited short term duration closures. However, given the extreme volume of rail traffic that approach turned out to be too disruptive to the BNSF schedules. Further compounding the challenge was the volume of river traffic which required the bridge to be operable. Consequently, Hamilton offered the alternative of using a top down approach that would allow the bridge to remain in service. Hamilton installed scaffolding, fabricated and erected a mobile crane that was attached to the top of the structure. This eliminated the need to occupy the tracks and therefore allowed the tracks to stay in service during the duration of the repair. Hamilton’s interactive approach and close working relationship with the client resulted in an alternative delivery method that minimized impact and exceeded expectations. This project includes the construction of three rail bridges, multiple retaining walls, and a unique and complicated crash wall. Designed to protect the existing WSDOT SR 432 bridge from derailed trains, the crash wall is positioned between active mainlines and bridge piers, and built directly under the SR 432 bridge. The new bridge over the Coweeman River is one of the longest through-plate girder bridges in BNSF history. Hamilton was contracted for the replacement of an existing BNSF rail trestle that was built in 1911. This complex accelerated bridge construction (ABC) project involved a 202-foot-long through-truss span, two through-plate girder spans, and two 41-foot precast box girder approach spans. Hamilton developed a lateral translation system used for the bridge change-out. The change-out included the complete removal of the old bridge and the installation of a fully assembled new bridge and was successfully completed within a 30-hour period, limiting the overall impact to the BNSF rail network. This project was the winner of the 2017 Best ABC Project Award. Hamilton was the prime contractor for the replacement of a 908-foot steel truss bridge crossing the Willamette River in the mid-Willamette Valley. All of the work was accomplished using accelerated bridge construction (ABC) techniques under live rail traffic using bridge slides and vertical jacking. Hamilton played an integral role in designing the temporary work bridges to gain access within the right-of-way and coordinating with the US Coast Guard and Oregon State Marine Board to ensure environmental compliance for all in-water work. Hamilton successfully accomplished the demanding work required in five scheduled 30-hour closures. In total, over the course of three separate contracts, Hamilton successfully replaced the entire 1,600-foot-long structure without impacting rail traffic. 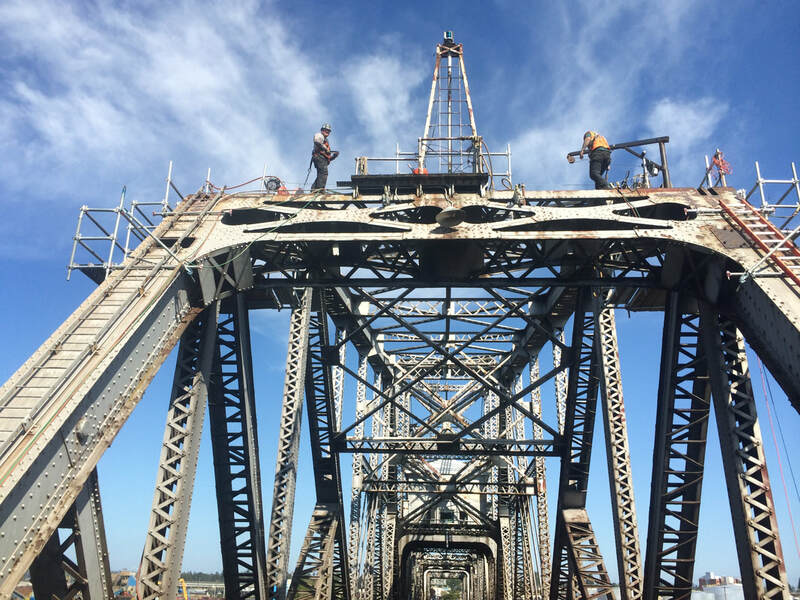 Portland’s Steel Bridge celebrated its 101st birthday in 2013 and Hamilton helped to ensure the venerable bridge will continue its second century in style with a revamp of its counter weights and steel plates. Work required significant site coordination including roadway closures and staging. Hamilton worked with the railroad’s engineer to place the newly fabricated steel plates onto the existing counterweight system. The Steel Bridge’s unique double-deck vertical lift is the only one of its kind in the country. Its lower deck carries railroad and bicycle/pedestrian traffic while the upper deck carries road traffic and light rail making the bridge one of the most multi-modal in the world. At the Port of Vancouver USA, Hamilton Construction constructed a pile-supported, water-tight trench that is a critical step toward enabling the port to triple its rail capacity. The “Trench Project” is a first step toward a new dual-use rail line entering the port and crossing underneath the existing BNSF and Union Pacific Railroad’s north/south Columbia River Railroad Bridge mainline. This portion of the project involved construction of a retaining wall that allows the new rail line to pass seven feet below river level and installation of 276 battered steel piles to support the track. The most challenging portion of the project involves a section where pile is driven on a four-to-one batter underneath the existing BNSF Bridge with less than a 30-ft. clearance. This is part of a $137 million capital upgrade – the largest in the Port’s history. At the request of the Union Pacific Railroad, Hamilton Construction led the emergency response when it was discovered an aging railroad bridge, long out of service, was in immediate danger of toppling over into Oregon’s Clackamas River. Upon inspection of the bridge’s cracking foundation, the situation was deemed too unsafe for crews to repair. The area was immediately secured, including stopping river traffic underneath. Then Hamilton, working closely with UPRR, law enforcement, regulatory agencies and a team of subcontractors devised a method of dropping the bridge and pulling it out the river with a heavy winch system. With high power lines on one side of the bridge and a water processing facility on the other, Hamilton’s scheme to drop the bridge straight down was critical to the successful outcome of the situation. The bridge drop occurred precisely as planned. The bridge was demolished as it was pulled out the river, cut into sections and removed.